The Morocco ceramic and porcelain tiles market is expected to grow in the near future owing to the growing sense of aesthetics among consumers. This is mainly due to wide scale production of low-grade cement tiles in the region. The rise in the market is attributed to the growing tourism sector and improving lifestyle of people in the region. The changing preference of consumers toward modern and elegant porcelain tiles is the primary factor driving the global ceramic and porcelain tile market in the near future. The global commercial roofing materials market is divided on the basis of type, material and bathroom. On the basis of type, the ceramic and porcelain tiles market is segmented into glazed porcelain, full-body porcelain, ceramic floor tiles, ceramic wall tiles, and thin tiles. Among all of them, full-body porcelain tiles is likely to hold more than 30% the of global market shares in 2015. This is mainly because of the increasing demand for full-body porcelain in the regional market of the Morocco. On the basis of bathroom material, the ceramic and porcelain tiles market market is segmented into floor and wall. Both the segment jointly hold their dominance in the Morocco ceramic and porcelain tiles market. This is mainly due to the growing inclination of the consumer toward expensive sanitary ware items. International players are taking an advantage of the shifting trend by launching aesthetic and exclusive brands in the region. On the basis bathroom furniture & accessories, ceramic accounted for more than 40.0% in 2015. The competitive landscape of the Morocco ceramic and porcelain tiles market displays a fierce competition. This is mainly due to the presence of several local and international players in the region. 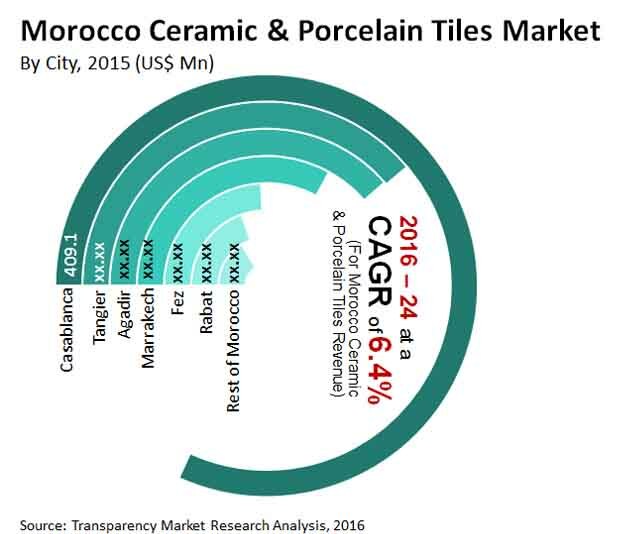 Major players operating in the Morocco ceramic and porcelain tiles market include Roca Sanitario, CERA Sanitaryware Limited, S.A., Jaquar, Kohler Co., HSIL Hindware, Grohe AG, and Hansgrohe Group. These players are adopting innovative strategies like product proliferation, branding and advertisement to tap growth. In terms of revenue, Casablanca held a share of more than 30.0% in 2015. Casablanca is the economic capital and leading financial hub of Morocco. Major industrial facilities and several Moroccan and international companies are based in Casablanca. A major share of the population of Morocco is economically middle-class. In such situation, numerous segments of ceramic and porcelain tiles offer a cheaper alternate to the population in the region. The Morocco ceramic and porcelain times market is expect to rise in future owing to the increasing efforts by the Ministry of Housing and Urban Policy (MHU) to develop residential housing. Construction is one of the important industries in Morocco. Rise in the number of households and growth in tourism have propelled the need for new construction projects for residential and commercial purposes. Cities such as Tangier, Agadir, Casablanca, and Marrakech are forerunners in upcoming construction projects in Morocco. Flooring materials typically used in Morocco are locally manufactured, low-quality ceramic tiles and cement tiles. However, the trend is likely to change in the next few years, due to shift in consumer preference toward aesthetic, full-body and glazed porcelain tiles. Glazed porcelain tiles are ideal for living rooms and kitchens primarily due to their elegant look and longevity. However, in terms of volume, ceramic materials presently dominate the bathroom materials industry for both new construction and renovation segments, followed by natural stone and porcelain. Increasing inclination toward modular furniture in commercial construction is expected to be one of the major shifts in the construction industry in Morocco during the forecast period. This report analyzes and forecasts the ceramic & porcelain tiles, and bathroom materials, furniture & accessories market in Morocco. The market has been forecast on the basis of revenue (US$ Mn) from 2016 to 2024, considering 2015 as the base year. The study includes drivers and restraints for the market in Morocco. It also covers impact of these drivers and restraints on demand for ceramic & porcelain tiles, and bathroom materials, furniture & accessories during the forecast period. The report also highlights opportunities in the ceramic & porcelain tiles, and bathroom materials, furniture & accessories market in Morocco. The report includes detailed value chain analysis, which provides a comprehensive view of the market in Morocco. Porter’s Five Forces Model for the ceramic & porcelain tiles, and bathroom materials, furniture & accessories market has also been included to help understand the competitive landscape in the market. The study encompasses market attractiveness analysis, wherein end-users have been benchmarked based on their market size, growth rate, and general attractiveness. The study provides a decisive view of the market in Morocco by segmenting it into products such as ceramic and porcelain tiles, and bathroom materials, furniture and accessories. These segments have been analyzed based on present and future trends. City-level segmentation includes current and forecast demand for ceramic and porcelain tiles, bathroom materials, and furniture and accessories in Casablanca, Rabat, Fez, Marrakech, Agadir, Tangier, and Rest of Morocco. The report provides the actual revenue for the ceramic & porcelain tiles, and bathroom materials, furniture & accessories market for 2015 and the estimated revenue for 2016 with forecast for the next eight years. Market revenue is in US$ Mn for the ceramic & porcelain tiles market and in US$ Thousand for the bathroom materials, furniture & accessories market. In order to compile the research report, in-depth interviews and discussions with a number of key industry participants and opinion leaders have been conducted. Primary research represented a bulk of research efforts, supplemented by extensive secondary research. Key players’ product literature, annual reports, press releases, and relevant documents have been reviewed for competitive analysis and market understanding. Secondary research includes a search of recent trade, technical writing, Internet sources, and statistical data from government websites, trade associations, and agencies. This has proved to be a reliable, effective, and successful approach for obtaining precise market data, capturing industry participants’ insights, and recognizing business opportunities. Secondary research sources that are typically referred to include, but are not limited to company websites, annual reports, financial reports, broker reports, investor presentations, SEC filings, internal and external proprietary databases, relevant patent and regulatory databases such as ICIS, Hoover’s, oneSOURCE, Factiva, and Bloomberg; national government documents, statistical databases, trade journals, market reports, news articles, press releases, and webcasts specific to companies operating in the market. The report comprises profiles of major companies operating in the Morocco ceramic & porcelain tiles, and bathroom materials, furniture & accessories market. Key players in the market include Roca Sanitario, S.A., Jaquar, CERA Sanitaryware Limited, Kohler Co., Grohe AG, HSIL Hindware, Hansgrohe Group, Kajaria Ceramics Limited, Duravit, S.B.S. Porcher, Supercerame, Porcelanosa, Marazzi, NG Kütahya Seramik, Jacob Delafon, Creavit, and RAK Ceramics. Key market players have been profiled in terms of attributes such as company overview, financial overview, business strategies, and recent developments.